It has been a very enjoyable start to 2016, for the fives club. We continue to hold club nights every Thursday (new members always welcome!) whilst our matches have included a very close victory against Old Tonbridgians and a revenge win against the exceedingly promising Whitgift school team. 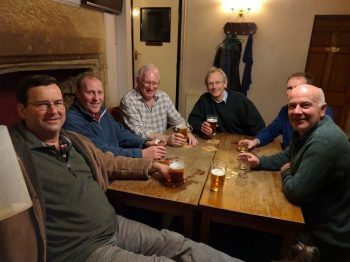 In March, an eight-strong party headed to The West Country for our annual – and very convivial – three day tour; we got the better of a Sherborne masters/boys team but were well beaten by the Exeter/Tiverton club at Blundell’s – perhaps the previous night’s curry and drinks took their toll. Our third match at Clifton was going along very closely when one of the players had to go to hospital with an irregular heartbeat! Thankfully he made a full recovery – the surprise was that it was one of the youthful players rather than one of us more ‘mature’ types! A special mention for the irrepressible Nick Morgan, master in charge of fives at Whitgift, who with much effort and great enthusiasm has helped the school teams reach a very high standard (national finalists!) and still found the time to join us as a ‘virgin’ tourer this year.